I am a clumsy one. No doubt about it. And my clumsiness got the best of me. I dropped my beloved Urban Decay Naked 2 palette and one of the shades shattered into pieces! :( I panicked and frantically Googled 'how to fix broken eyeshadows' because of course, Google knows everything. So this is how I managed to fix my eyeshadow. Step 1: Pour a small amount of rubbing alcohol into a paper cup. Step 2: Dip the plastic spoon into the rubbing alcohol to sanitise it. Step 3: With the sanitised spoon, break the eyeshadow into fine powder particles. Make sure you have a piece of tissue or paper underneath in case you make a mess (which I did lol). Your eyeshadow should now look something like this. Step 4: Add a small amount of rubbing alcohol into the powdered eyeshadow. Make sure you add enough rubbing alcohol to saturate it, but not too much as to make it a pool. Step 5: Mix it well until a paste forms. Step 6: Wrap a clean tissue around the piece of cut-out cardboard and firmly press down on the eyeshadow. Step 8: The eyeshadow is now looking nice and firm! All you need to do now is to let it dry before using it again. But the palette's looking a little messy so let's clean it up with some tissue and rubbing alcohol. No more broken eyeshadow - Check. Clean eyeshadow palette - Check. Happy Court - Check. I hope this step-by-step guide helped you! 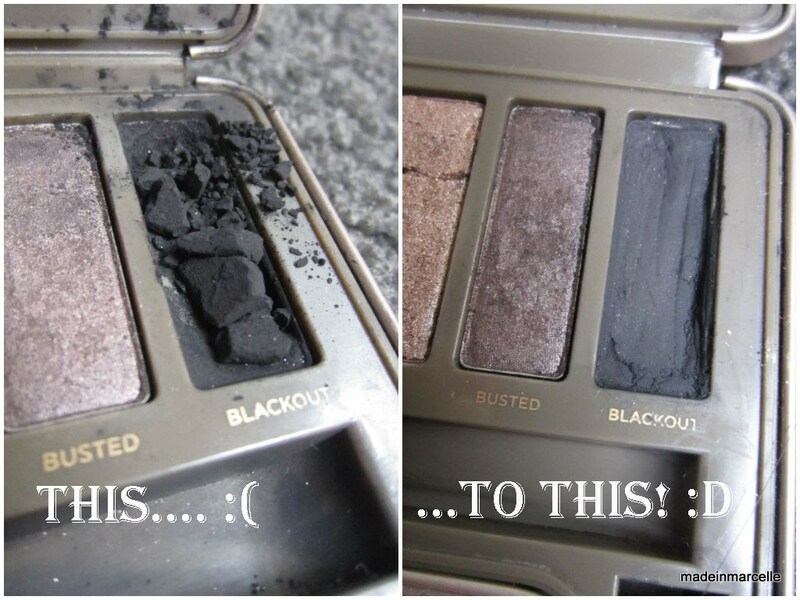 Which eyeshadow have you had broken and if you have, how did you fix it?